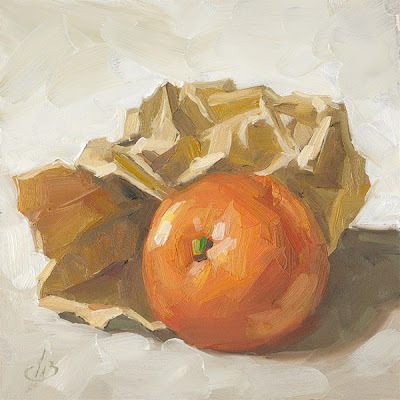 It was fun to paint something as commonplace as a crumpled bag, and I was interested in how the light filtered through the brown paper on the left side of the bag. A nice simple, solid composition. Email me at tombrownstudio@cox.net if you’re interested in this painting or if you would like to commission me to create a special painting for your home or office. To view paintings available on my website, click the headline above today’s image. Thanks for looking. While visiting Venice, Italy I took a small boat to the tiny island of Murano to watch the outstanding artistry of glass blowers at work there. I brought back a number of pieces that interested me, some of which had exquisite and unusual colors. 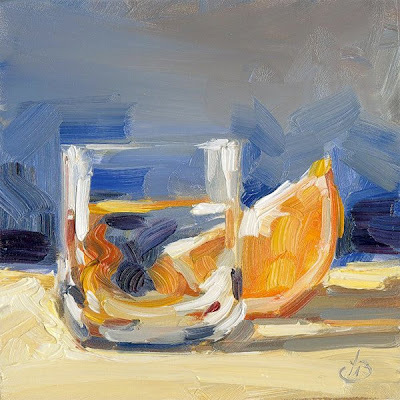 This painting is a fairly simple composition in terms of shapes, but I was intrigued by the unique colors within the glasswork. I hope you like it. 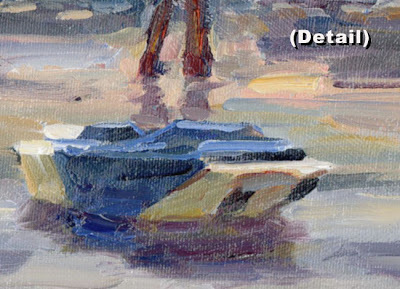 This painting began with a small rough sketch to establish the composition and patterns of lights and darks. The sketch served as a valuable guide as I painted the canvas, helping to maintain the initial feeling I had planned to capture. I particularly liked the weathered wood and occasional missing planks of barn siding, which suggested the title for this piece. By the way, in yesterday’s blog post I mentioned that if you’re an artist who hasn’t yet tried painting outdoors from nature, I strongly encourage you to give it a try. 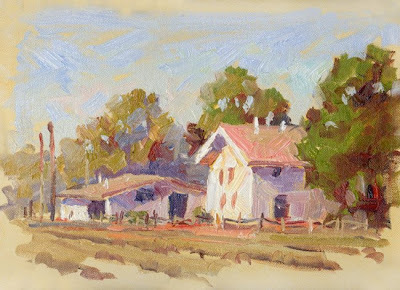 There’s nothing like plein air painting to make your work come alive. You don't need lots of expensive equipment like a French easel to get started. I can tell you how to get set up without spending a cent. Many viewers have emailed me for the information, and the offer still stands. Let me know if you’re interested. 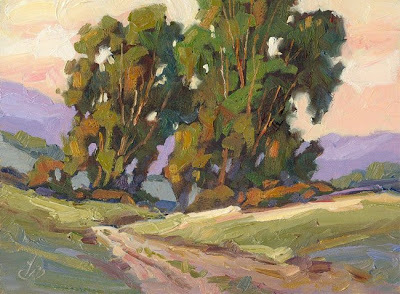 For details about my instructional CDs on OIL PAINTING FOR THE BEGINNER or my CD on PLEIN AIR PAINTING click the headline above. Complete information is on my website. I feel very fortunate to live in a paradise like this, and to be able to capture some of the beauty in paintings. If you’re an artist who hasn’t yet tried painting outdoors from nature, I strongly encourage you to give it a try. 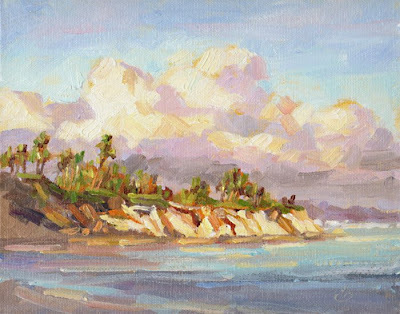 There’s nothing like plein air painting, and your work will come alive. By the way, you don't need lots of expensive equipment like a French easel to get started. I can tell you how to get set up without spending a cent. Email me if you're interested. If you’re interested in my instructional CDs on OIL PAINTING FOR THE BEGINNER or my CD on PLEIN AIR PAINTING click the headline above. Details are on my website. 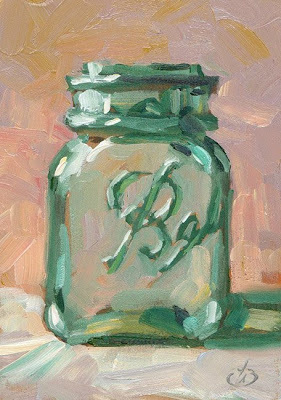 I have warm childhood memories of mom filling these jars with tomatoes and other tasty things from our garden for the winter months ahead. In the back of our basement were long rows of shelves stocked with colorful jars of every shape and size. I was always fascinated with the interesting locking device for the lids. 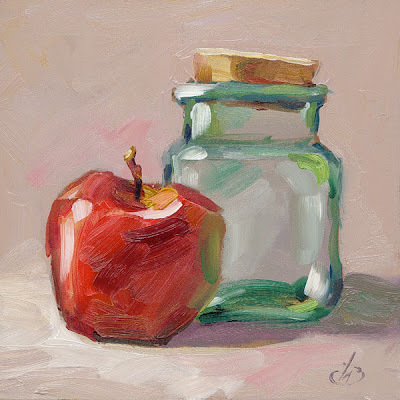 If you’re interested in my instructional CDs on oil painting click the headline above. Details are on my website. If you wish to purchase this painting, email me at tombrownstudio@cox.net for details. Shipping is free, and I accept PayPal or personal checks. 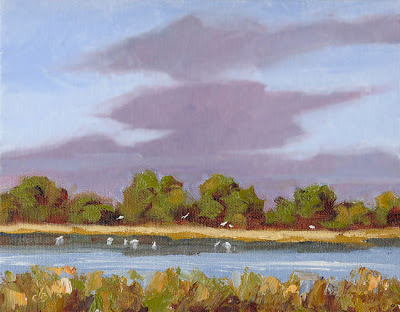 This is a larger painting than I usually create on location but I felt inspired by the location and beautiful weather. 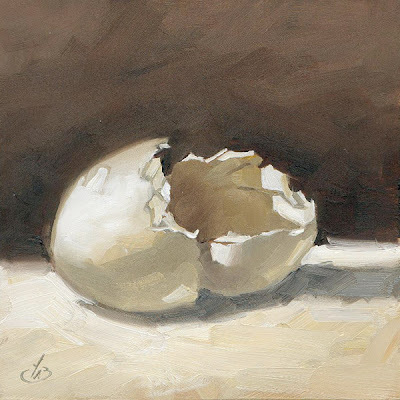 This canvas has very soft, muted colors and bold brushwork. I think it will bring a breath of fresh air and sunshine into any room. 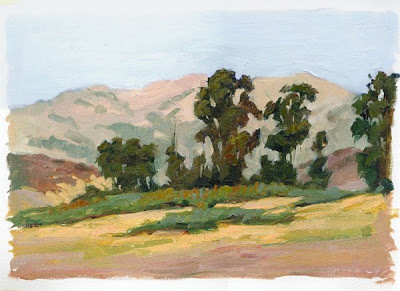 I painted this while conducting my usual Saturday morning Plein Air class. Pictured above are some of the other artists who joined me. We had a wonderful time painting together; thanks for joining me everybody! If you wish to purchase this painting, email me at tombrownstudio@cox.net for details. Shipping is free, and I accept PayPal or personal checks. I ship to the United States only. I wanted to show the way the light filtered through the bottom part of the letter, and I liked the way the rose cast shadows on it. 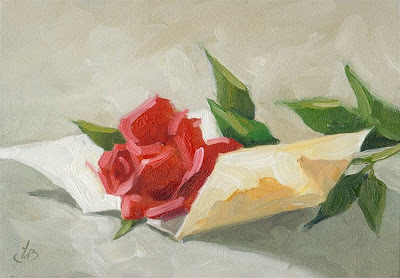 This is a very simple composition that seems to have an interesting story, and the color of the red rose is a nice focal point. 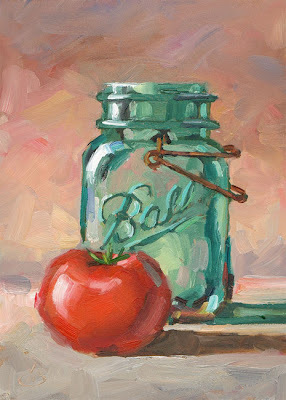 I have warm childhood memories of mom filling these jars with tasty foods from our garden for the winter months ahead. Mom would often use melted paraffin to seal the jars before adding the lids. I remember she heated the paraffin very carefully in a double boiler to avoid it catching fire. In the back of our basement were long rows of shelves stocked with colorful jars of every shape and size. 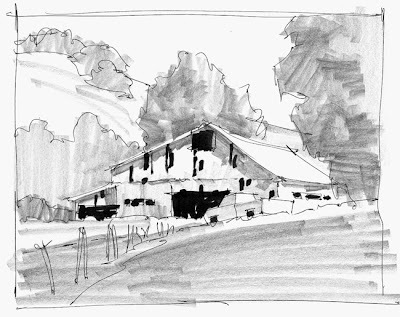 This is a preliminary study for the scene we painted Saturday morning in my Plein Air Workshop. 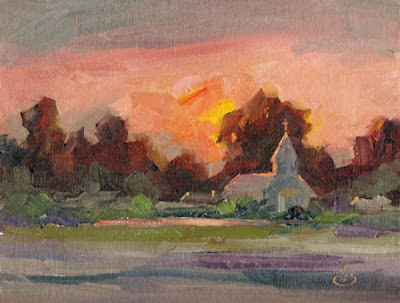 It is a vignette on a toned canvas measuring 9x11.5 inches. It was done to get us started and set the mood for the class. This study has very loose, bold brushwork. In the photos here you can see the actual scene with this painting on my easel, and photos of some artists in my workshop. 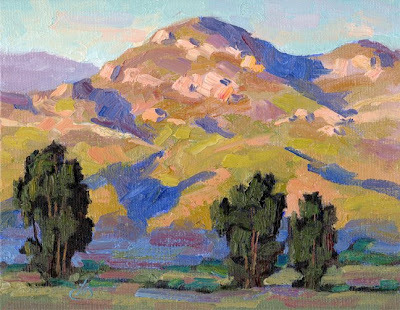 If you’re interested in my CD on “PLEIN AIR PAINTING MADE EASY” click the headline above. Details are on my website. REMINDER: I will do another FREE ART GIVEAWAY this month and you might be the lucky winner. The “rules” are simple: Today is not the day but when I post the notice, you will have 24 hours to email me your entry into the free drawing. There are no strings attached; even shipping is free. 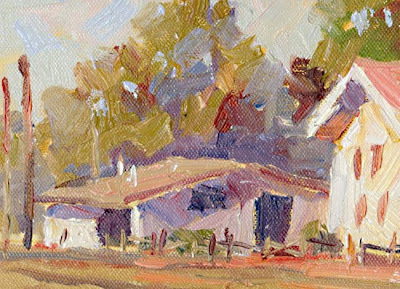 If you live in the Orange County area and would like to join me for my Saturday morning Plein Air workshop, email me for directions. We always have a great time together. This Saturday I will be working on a 12x18 inch canvas, which is a bit larger than usual. We will be painting some farm structures and row crops. ALERT: I will do another FREE ART GIVEAWAY this month and you might be the lucky winner. The “rules” are simple: Today is not the day but when I post the notice, you will have 24 hours to email me your entry into the free drawing. There are no strings attached; even shipping is free. I am currently working on several large commissioned pieces, each of which measures a full five feet in width. While doing studies for them on location I had the opportunity to capture this wonderful scene at sunset. This painting is loaded with pure emotion. I’ll bet it would look great on your wall. Email me at tombrownstudio@cox.net if you’re interested in this painting or if you would like to commission me for something specific for your home or office. ALERT: I will do another FREE ART GIVEAWAY this month and you might be the lucky winner. The “rules” are simple: When I post the notice, you will have 24 hours to email me your entry into the free drawing. There are no strings attached; even shipping is free. For the price of a poster you can own this original oil painting. Email me at tombrownstudio@cox.net for details. I accept PayPal and personal checks. Shipping is free to anywhere in the USA. I was fascinated by the refracted images seen through the glass of water. This actually has more artistic challenges than it seems. It takes close observation and attention to shapes, value changes and color in order to pull off a seemingly simple subject like this. Enjoy! FREE ART GIVEAWAY - Keep watching. I will do another FREE ART GIVEAWAY this month and you might be the lucky winner. The “rules” are simple: When I post the notice, you will have 24 hours to email me your entry into the free drawing. There are no strings attached; even shipping is free. 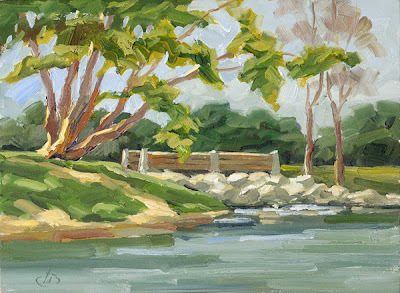 This serene scene was painted at Irvine Regional Park during my usual Saturday morning plein air class yesterday. 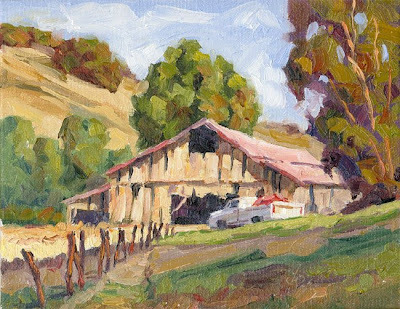 This was a wonderful location to paint, and we had ideal weather and great group of fellow artists to work with. It was a perfect way to spend the morning. I will post the next installment of art-career tips that I hope will be useful. The focus will be online marketing and expanding your market. This is the best time in history to be a professional fine artist, and I’ll show you why. “Thanks Tom! 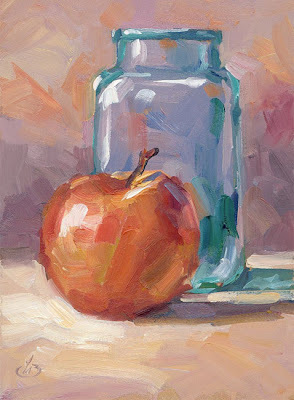 Earlier this week I entered a contest to win a free oil painting created by the very talented Tom Brown and I won! The “rules” are simple: Keep watching my blog every day. When I post the notice, you will have 24 hours to email me your entry into the free drawing. There are no strings attached; even shipping is free. For the price of a poster you can own one of the timeless original oil paintings shown on my blog. 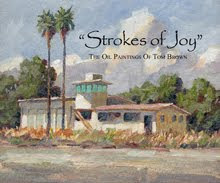 If you are interested in a purchase, email me for details at tombrownstudio@cox.net. I accept PayPal and personal checks. I ship to the USA only. If you are interested in my CDs on PLEIN AIR PAINTING or BEGINNING OIL PAINTING, click the headline above for details on my website. 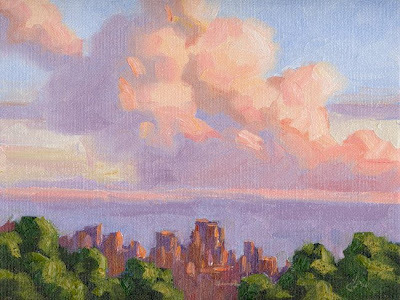 This was painted on location not long ago because the vista was so beautiful that it moved my spirit and demanded to be preserved on canvas. It shows a scene in Southern California that is now under construction to become a housing tract. Soon all this will be gone forever. I painted this on unstretched canvas, vignetted around the edges. It was actually done as a study that I intended to use when creating a large piece in the studio, but I never did paint the larger version. I’m glad I captured this scene when I had the opportunity. The overall canvas measures approximately 13x9 inches, and the painted area is a bit larger than 8x12 inches. If you are interested in purchasing this email me for details at tombrownstudio@cox.net. I accept PayPal and personal checks. I ship to the USA only. I was fascinated by the refracted images seen through the glass of water. A painting like this actually has more artistic challenges than it seems. It takes close observation and attention to shapes, value changes and color in order to pull off a seemingly simple subject like this. Enjoy the view! 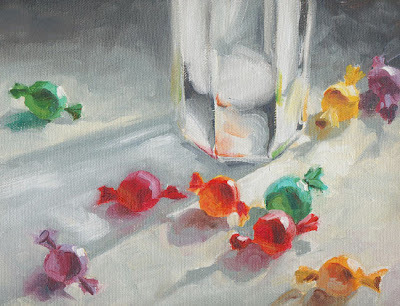 For the price of a poster you can own this original oil painting that will bring a breath of fresh air and sunshine into any room of your home. To purchase it, email me at tombrownstudio@cox.net. I accept PayPal and personal checks. Shipping is free to anywhere in the USA. The trunks of eucalyptus trees are an artist’s delight. The bark peels off in multi-hued layers of unlikely colors like mint green, mauve, burgundy and more. It’s truly a joy to paint. 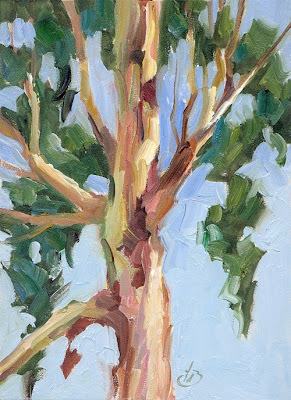 I did this and a number of other studies of eucalyptus on location in preparation for a large commissioned piece I am about to begin. By working swiftly and intuitively from nature I am able to capture the essence of the subject. 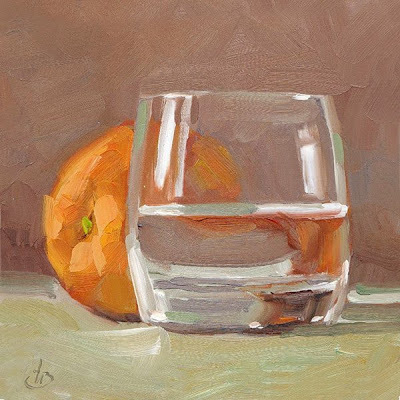 I use this information to keep the freshness in the larger painting done in the studio. 1) I will post the next installment of art-career tips that I hope will be useful. The focus will be online marketing and expanding your market. This is the best time in history to be a professional fine artist, and I’ll show you why. This 18-inch-wide Plein Air painting is larger than I normally work when I am on location, but I felt the scene required it to capture the expansive feeling of the harbor. 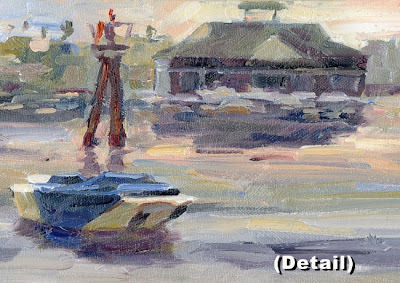 I painted this from the edge of Balboa Island in Newport Beach during a Plein Air workshop I was teaching. Among the interesting passersby I met during the morning was a couple in their 80's who were on their honeymoon. Love is grand! Thanks for looking, and if you’re interested in purchasing this painting please email me for payment details. 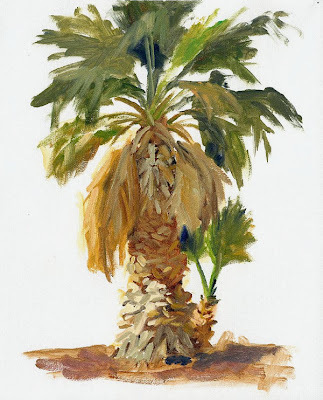 This palm tree study was never intended to be completed; I did it only to capture specific information about the interesting textures and color changes on the trunk where fronds had been trimmed. I also wanted to record how the baby palm was sprouting near the base of the large palm tree. This is like a glimpse over my shoulder so you can see the artistic process in action. It is much larger than most “studies” but I had a large canvas and I was feeling particularly loose and free. I also needed to work big enough to capture all necessary detail.